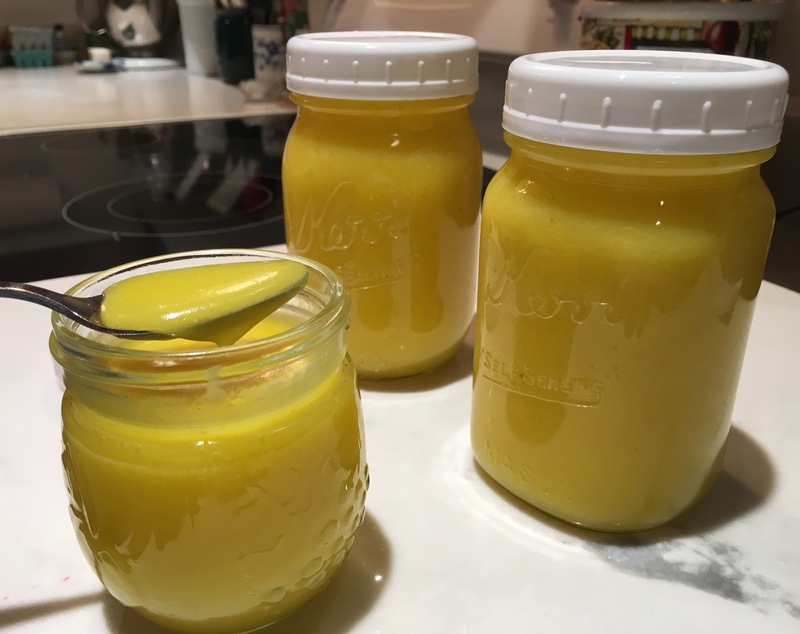 I’ve experimented with lemon curd over the years but never found a recipe with the flavor balance I was looking for. I prefer it on the lighter side by making the curd with whole eggs rather than yolks. I also like the sweetness of Meyer lemons. This combination of lemon and lime, finished with a few drops of vanilla seems to hit all the right notes for me. It is such a useful ingredient to have around at this holiday season. You can fill cookies such as kifli or thumbprints with the curd as well as cakes, tarts and pastries. It is delicious slathered on toast, biscuits, crepes or waffles for Christmas morning. It makes a nice gift for neighbors and friends too. I like to make two batches at a time and freeze some of it for later use. The recipe is adapted from Ina Garten. Place sugar in the bowl of a food processor. Grate lemon and lime zest over the sugar. Pulse to mix the zest and sugar together. Transfer the citrus sugar to the bowl of a mixer. Place the strained lime juice into a liquid measuring cup. Add enough strained lemon juice to make 1 cup of mixed citrus juice. If you are a little shy, add the juice of an extra half a lemon. Set aside. Add the softened butter to the mixing bowl with the citrus sugar and beat for two minutes until well mixed. Add eggs one at a time then add salt. Use a spatula to scrape down the sides of the bowl. Slowly pour the strained citrus juice into the sugar mixture. It will look a bit sludgy. Pour mixture into a 4-quart pot and turn the heat to medium low. Stir frequently for 15-20 minutes until the mixture has turned smooth, has thickened and is beginning to bubble. Remove from heat and stir in vanilla. Strain the curd then pour into jars. Makes 5 cups. This entry was posted in Breakfast, Christmas, Cookies, Custards, Desserts, Easter, Fruit, Jams and Jellies, preserving. Bookmark the permalink. Wow! It sounds absolutely heavenly!